James King, a Santa Barbara resident for 40 years, was born in San Francisco as the 7th of 9 children. His father was a Russian immigrant born in China and his mother’s Irish/Welsh family had been Californians since the 1850’s. James’ love of life and adventure began at an early age when he and his brothers had the freedom to roam San Francisco. James married young, had two wonderful children with his first wife, spent two years as an Army staff sergeant working for a three-star general in Berlin, Germany during the Viet Nam War, and was the first ever in his family to graduate from college. He received a BA in Psychology from San Francisco State University. His love of adventure was sparked by his hiking the Sierra’s as a teenager and flowered when he met the love of his life, his wife of 42 years, Alice Alldredge, while she was walking down a dusty road in Baja California carrying two scuba tanks. He stopped to ask her if there was anywhere nearby to camp and the rest is history. Together they had a third wonderful child and traveled the world as marine biologists. He had many shark encounters in Australia, Polynesia, Micronesia, coastal California, Hawaii, and the Sea of Cortez. He explored the bottom of the ocean in submersibles, survived a hurricane on a desert island in Baja California, helped rescue a burning freighter at sea, went skydiving over the islands of Palau with a defective parachute, and trekked the Himalayas. He loved photography and won several international photo contests. In his later years in Santa Barbara he had his own business as a handy-man, jack-of-all-trades until his retirement. James was a skilled and gifted man who enjoyed using all of his talents to help others. He was known for his tremendous generosity, kindness, quick sense of humor, spontaneity, love of cooking and dancing, and big heart. He was deeply loyal to family. He told every sibling, niece, nephew, and grandchild, ”You are my favorite” and they believed him. 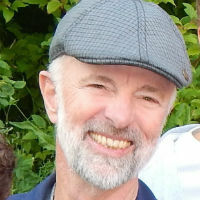 He died unexpectedly 3 months short of his 70th birthday from trauma due to a bicycle accident. He is survived by his wife, Alice; 3 children, Nathan King (Joanna), Neysa King – Connolly (Michael), and Reno King (Sara); 4 grandchildren, Ryan, Jayden, Jonathan, and Josephine; 2 brothers, Dennis and Robert King, 3 sisters, Jean Bonetti, Virginia Gonzalez, and Beverly Kleven, and loads and loads of nieces, nephews and their children. He leaves a huge, heart-shaped hole in all our lives. A Memorial of his life will be held at 7 pm on Friday, Jan 22 at Unity Church, 227 E Arrellaga St., Santa Barbara.